Happy Hump Day ladies and gentlemen! I am kind of freaking out how quickly this week is going, especially since I am splitting town in a week and have about a MILLION things to do!! But you know what makes Wednesday’s better? Well, really any night better? Pasta. Um, and Lobster. 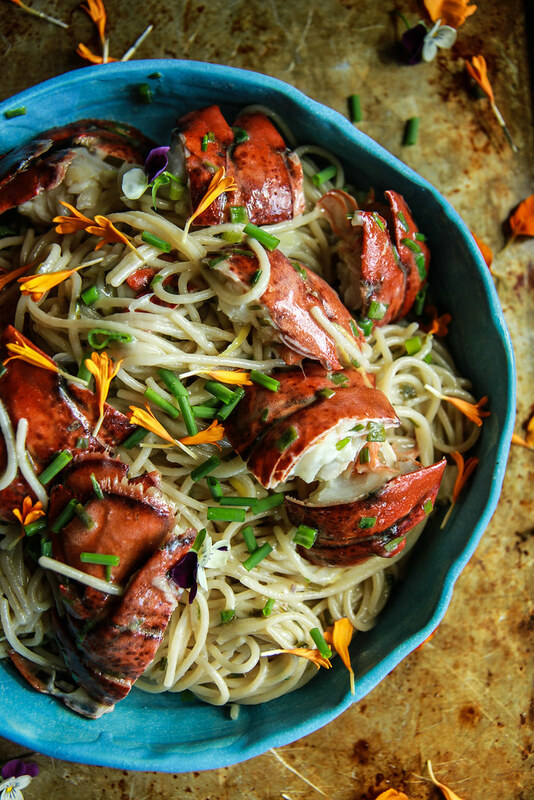 How about Lemony Lobster Pasta? And then dump a ton of fresh chives in and that makes it even better! We went from summer temperatures over the long weekend and now we are back to gray rainy days and a big bowl of cozy pasta was back on my radar. 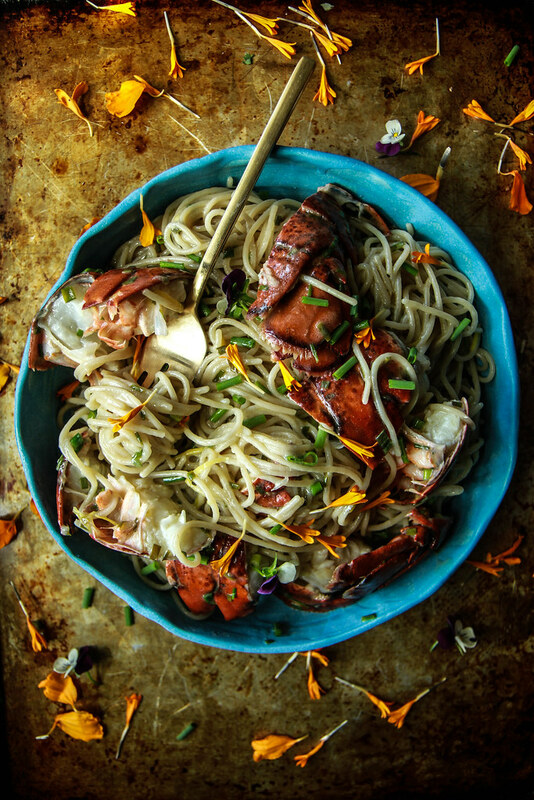 However- this dish is massively brightened up for Spring with it’s fresh, tangy Lemon Olive Oil Sauce and big chunks of luscious lobster- YUM!! On top of being truly gorgeous and drool inducing, this is truly so incredibly easy and fast, but it turns out to be the most decadent and delicious pasta dish- perfect for entertaining or simple enough for weeknights! And I would DEFINITELY serve it along with this AMAZING salad. Hope you enjoy it! Bring a large pot of salted water to a boil. Add the lobster tails and simmer for 8-10 minutes until the meat is just cooked through. Pull the meat out of the shell and chop into bite sized pieces. Bring the water back to a boil and add the pasta. Cook to al dente, (a minute or two before cooked through) according to the manufacturers directions. While the pasta is cooking, make the lemon sauce. In the jar of a blender, combine the garlic, honey and lemon juice and puree on high. Stream in the olive oil until you get a thick pale yellow sauce. Season to taste with kosher salt and then stir in the chives. Set aside. When the pasta is al dente, reserve a half cup of water and then drain the rest of the pasta and rinse it with cold water and drain again. Add the pasta back to the pot over medium-low heat and add the sauce and the lobster to the pasta. Stirring constantly and adding a few tablespoons of the reserved pasta water to keep the pasta loose, cook until hot and you have a nice sauce that coats the pasta and the lobster. I like it very much, Thank you for this Recipe Heather! Such a beautiful dinner recipe!! Love this! Pasta makes everything better, especially when it looks like this! Luv all things Seafood, Shellfish and Pasta. That’s a Beautiful dish! Question though. What’s the purpose in the instruction of rinsing the cooked pasta in cold water before it’s again heated back up with the sauce? Is that to remove any excess starch from the just cooked pasta? Yes! exactly! It really only applies for Gluten-free pasta which can get SO sticky if you don’t rinse the excess off! 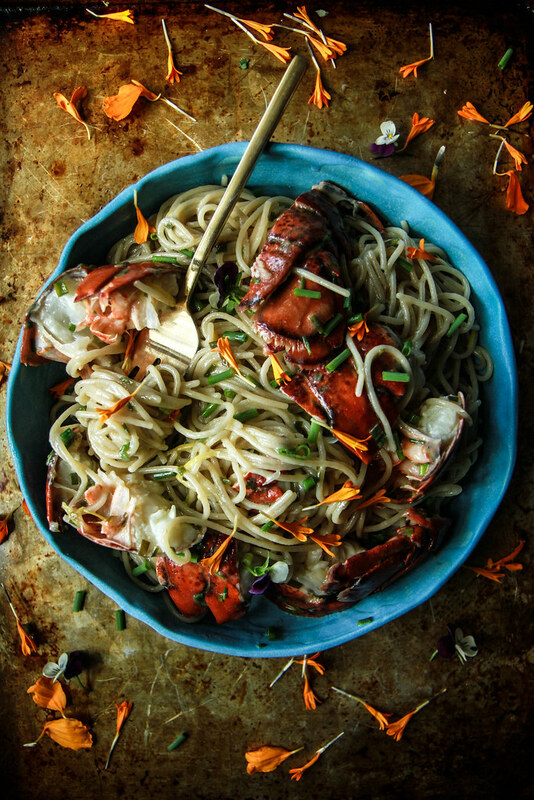 This lobster pasta is calling me! My little seafood lovers will gobble this up! Whoa!! This seafood pasta is soon tempting right now!